Worldwide production in 2010 amounted to almost 1.4 million tons, 30% of which came from Italy, with 27% from New Zealand, 17% from Chilli and 19% from North, Central and South America.The varieties Actinidiadeliciosa (var. Abbott, Allisson, Bruno, Hayward and Monty), Actinidiachinensis, Actinidiaarguta, Actinidiakolonikta and Actinidiaeriante are particularly popular for cultivation purposes. The right moment for harvesting kiwis can best be determined by measuring refraction because this corresponds to ripeness and eating quality (in contrast to colour and firmness). In New Zealand they apply a minimum refraction level of 6.2%; fruits below this level are not good for storing and are less tasty when ripe.A higher level of 7-9% is advised if long-term storage is to take place. 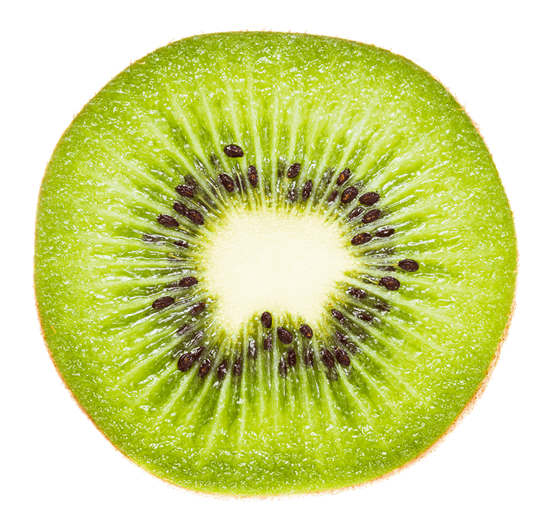 Kiwis produce very little ethylene but are extremely sensitive to this gas.The manual harvest of kiwis must be carried out with great care as damaged fruits immediately increase ethylene production and this can cause problems for other fruits. In order to prevent the development of Botrytis, it is important to harvest in dry weather. The pre-cooling process is not used everywhere; in California, it is best to cool the harvest as quickly as possible to 0ºC however, in New Zealand, a ‘curing’ process is used (2 days at ambient temperature and then cooled). Curing reduces the chance of rot (Botrytis) and prevents 'stem end rot’.Curing can lead to some moisture loss and may cause the stalk scar to dry out. Under optimum storage conditions at a temperature of -0.5ºC and 0ºC and a relative humidity of 90 to 95%, kiwis can be stored for between 3 and 5 months.CA storage extends the period for kiwis by 3-4 months and increasing levels of CO2 results in better retention of firmness.Reduction of the O2 level inhibits ripening.Flavour may deteriorate with an O2 concentration of lower than 1% and internal breakdown can occur with a CO2 concentration higher than 7%. For kiwis, the most important aspect under CA conditions is to use ethylene adsorbers to keep the ethylene level as low as possible. The optimum storage conditions for kiwis depend on the variety, harvesting moment, region, location of orchard and cultivation conditions as well as fertilisers and crop protection agents used, care procedures and the age of the orchard. The advice below is generally scientifically accepted but is not specific to a particular region or orchard. It is, therefore, only an indication and no rights can be derived from this information. Ask a local university of research body for further advice.